In this month’s Teen Travel Chat, our teen correspondent Brooke visited Las Vegas and shares why it is a perfect family destination. Las Vegas is filled with lots of things to do and see. The variety of sights, shows, activities, and restaurants is tremendous! If you plan a trip there for a week, like my family did, you will get a good taste of all there is to do in Las Vegas for families. 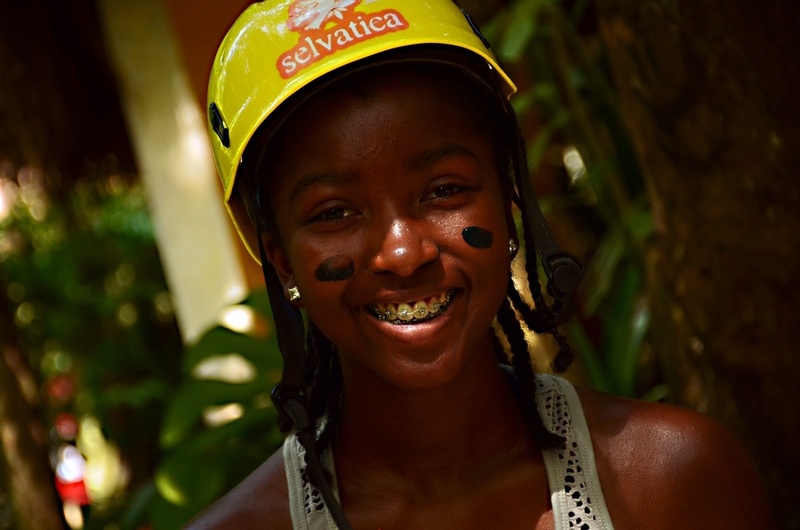 This is a perfect vacation spot for anyone of all ages because there is something for everyone. My family made incredible memories and had so much fun in Las Vegas! This trip was unforgettable. When we arrived in Las Vegas, my sister and I saw slot machines for the first time at the airport. Of course, we saw plenty more over the course of the week we spent in Las Vegas, but we did not expect to see any in the airport. Although we arrived in Las Vegas later in the evening, we still did a little exploring. We walked around to see what restaurants and other places were in close proximity to the resort, and made our usual stop for a few groceries. It was awesome having the valet staff open the car doors for everyone just moments after you pulled in the circle drive, near the front entrance of the resort. My sister and I felt like we were celebrities. The day after arriving in Las Vegas, we went sightseeing on the Strip. We walked around marveling at all there was to see. 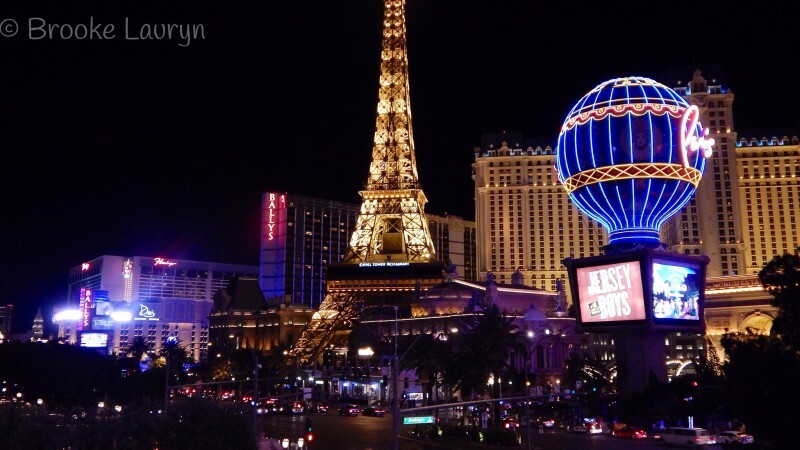 We saw a replica of the Eiffel Tower, elegant hotels like Caesar’s Palace, neon lights, a hotel that was shaped like an Egyptian pyramid (Luxor Hotel & Casino), and so much more! It was pleasantly overwhelming how much there was to see and potentially do. There was a mall called Caesar’s Palace Forum Shops across the street from the resort that had a lot of restaurants and shows. We visited Hershey’s Chocolate World on the Strip where I am proud to say that my sister held the world’s largest Hershey bar. M&M’s World, Hard Rock Café, and World of Coca Cola were close by. This area has a lot of interesting things to do and places to walk in and explore. 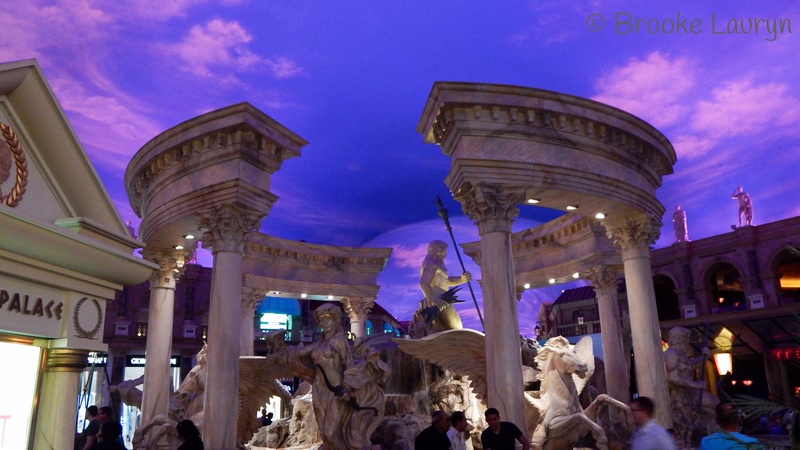 In Caesar’s Palace Forum Shops, my family and I saw a free ‘show’ called the Fall of Atlantis. I say show loosely because there are no places to sit. It is a timed production that happens just outside The Cheesecake Factory restaurant and Nike store. People can stand and watch a reenactment of the fall of Atlantis which lasts around 10 minutes. It is not too long, but keeps kids captivated for the time period. There are special effects like fire and smoke that help tell the story. I enjoyed it and thought it was pretty cool. Also on the Strip, we visited the Flamingo Wildlife Habitat. This is completely free (unless you decide to spend some cash for pictures with colorful parrots). There are a variety of animals there: flamingos, parrots, fish, ducks, turtles, and swans. It is actually a really pretty place with flowers in large pots, a waterfall, and of course palm trees! You are allowed to take as many pictures as your heart desires. This is definitely more laid back but can be great for kids. In addition to all of the compelling places we saw on the Strip, we also ventured into the Polaroid Fotobar & Andy Warhol Museum. I thought the store was super interesting! The old cameras were intriguing and brought me back to old pictures my parents captured on our Polaroid back in the early 2000s. After checking out the cameras, we went upstairs to look at the Andy Warhol museum. The original Polaroid camera model was on display, along with later models in chronological order. There were some incredible photos! 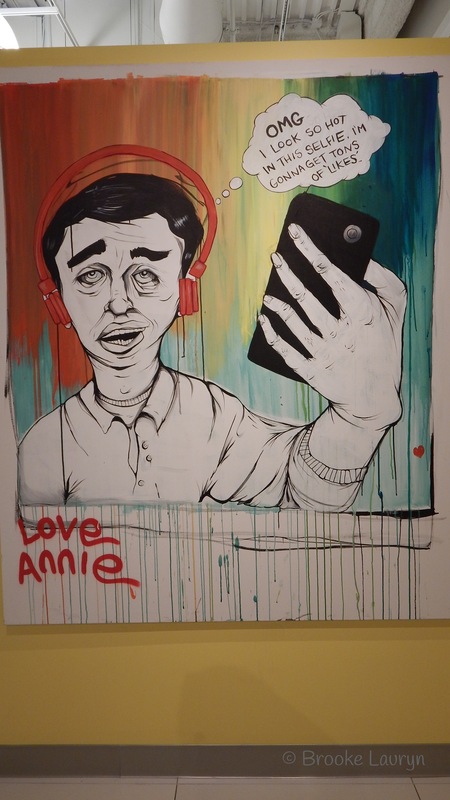 There were black and white portraits of notable celebrities, pictures Andy Warhol took himself, fun Polaroid camera designs, an ‘Instant Storytelling’ section of Instagram photographers, and original pieces of artwork by Annie Preece. One of the main non-Strip places we visited was beyond phenomenal! We went to Hoover Dam for the first time ever, which was exciting and also very scary. I was afraid of dropping my camera while I captured some of the photos, but it was so worth it! Hoover Dam is humongous and extremely breathtaking. I learned so much when we walked through the museum. We got to see the water tanks that control the dam and how they work. We even got to go inside the mountains on the side of the dam which hold all of these different tunnels. It was absolutely astonishing. 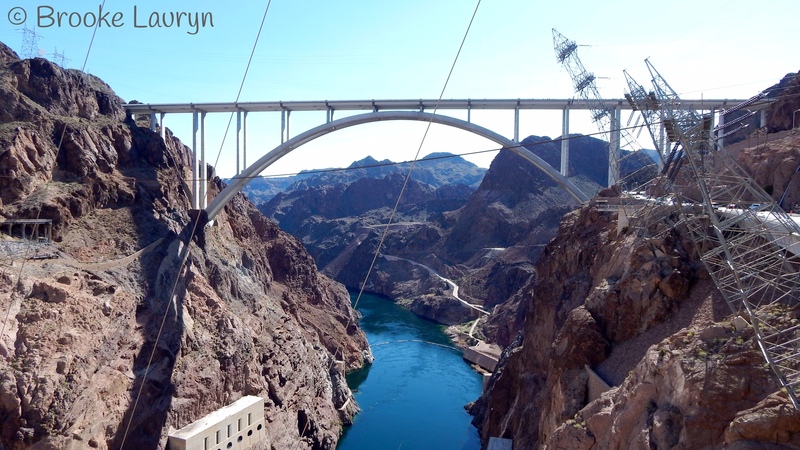 When you walk along the side of the dam itself, there is a highway bridge way up in the air that allows for transportation between Arizona and Nevada. We were able to walk across the bridge on the walk way. My mom was not really delighted at our decision because she has a mad fear of heights, but she still went along. Shout out to my mom. She was really brave for coming up with us! The view was gorgeous and terrifying at the same time, but I am so glad we made the trip to Hoover Dam. I will never forget it. 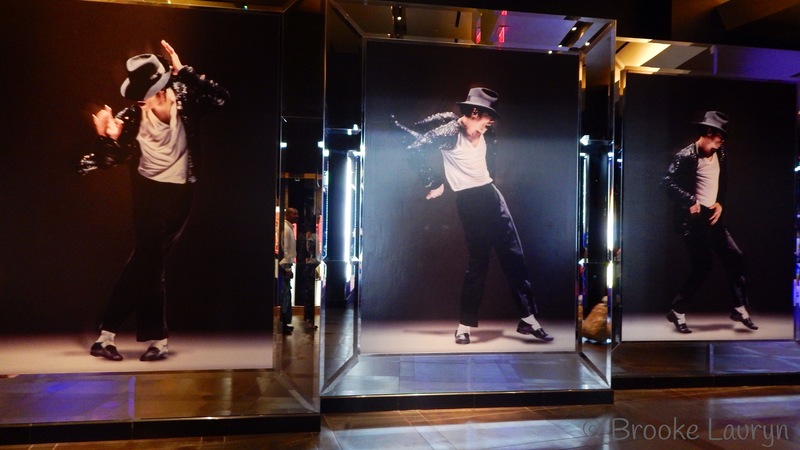 During the last few days of our trip, we went to see the Michael Jackson ONE Cirque Du Soleil show. I have loved Michael Jackson since I was very young and could not have experienced a better performance. I recommend everyone see this show, especially if you like Michael Jackson and his music! I am so grateful my parents took my sister and I to this show. It was magnificent and portrayed Michael and his life in the perfect way. The performers were brilliant. There is one super talented performer who plays Michael Jackson in the dance numbers. He has a prosthetic leg but that does not stop him delivering an outstanding performance. If you see the show with him in it, you are in for a treat! Everyone from age five and up will enjoy this show. It is a must-see show that will blow you away! The whole experience is one that I am so appreciative of and glad I had with my family. The last thing we did in Las Vegas was see the Blue Man Group. I had seen them before in commercials, but I did not really know what to expect. Right when the blue men came out, however, I knew it was going to be a great show. It was fun-filled, energetic, and entertaining. The audience is involved and can steer some parts of the show in different directions. There was one hilarious part where an audience member went up on stage. She was so nervous! The Blue Man Group was copying her every move and she didn’t know what to do. The overall show was filled with energy and I really enjoyed it. I highly recommend this to anyone who has kids, regardless of the age. The show is suited for all ages. Las Vegas is such a fabulous vacation spot. There are an endless number of things to do that will be unforgettable. Las Vegas is not just for the adults, it is a great destination for kids and families too! I am Brooke Lauryn. I am a high school student with diverse interests. I enjoy being a member of my high school band and marching at Friday night football games, along with participating in basketball and track & field. I appreciate art and music and learning about other cultures. I love spending time with my family and friends. 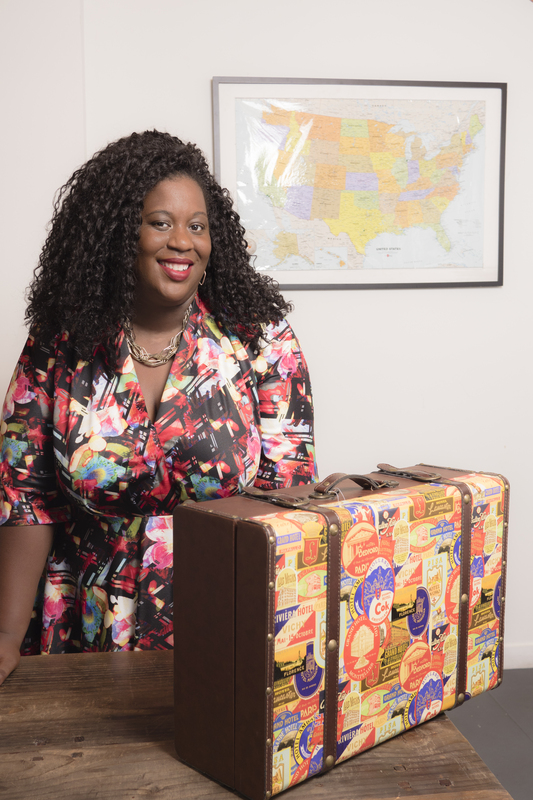 Since I was a child I have always enjoyed traveling, and I look forward to sharing some of my favorite places and “cool” things to do with you. I haven’t been to Vegas in years but I had so much fun! The shopping off the strip is the best. I went on a girls trip but I would totally go and take the kids next time. So much to see and so much to do! I have never been to Vegas, but I would to go go someday. The Michael Jackson performer sounds awesome. It so amazing what we can do with our bodies when we put are minds to it dispite disadvantages. Sounds like there is so much to do there in wouldn’t know what to do first! 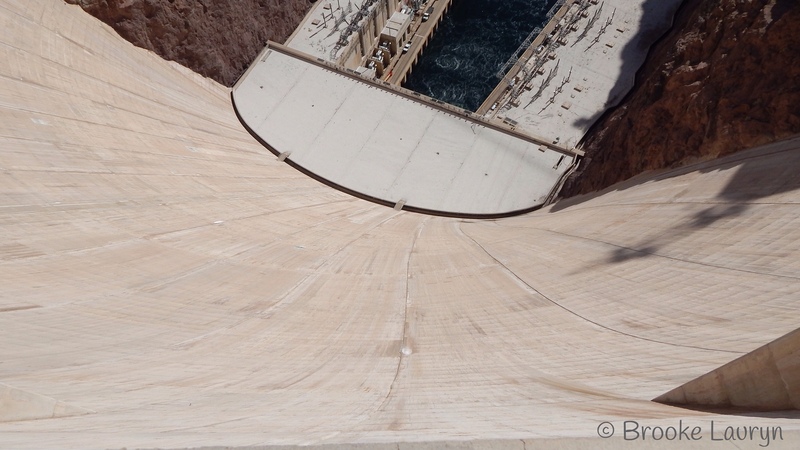 That picture of the Hoover Dam is amazing! Now you have me curious to see the scale of the Hershey’s chocolate bar! I was always under the impression that Vegas is not so ‘family friendly’ but never realized there were so many other options to explore. I did not realize that Vegas could be family friendly either until taking this trip and making so many memories! This was such an enjoyable trip and I think everyone can find something to do there. Wow! You visited a lot of places. There’s no wonder how this trip was so memorable for you. I hope to have someone tour me around since I will be able to maximize my time more when I know just where to go immediately. I have always WANTED to go to Vegas. 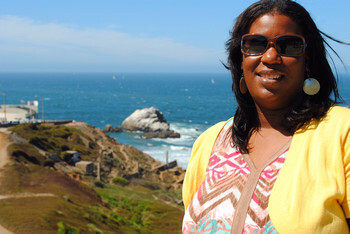 I wasn’t sure if I could bring my family or if it should be a girls trip or not. I think I can see both sides to Vegas now. The Hoover Dam would be quite the adventure, and I know my son would love to see the bright lights of Vegas! I did not know what to expect when my family traveled to Vegas, but I was pleasantly surprised at how we found family friendly things to do. I think it’s a great trip to go on with family, but a girls trip sounds really nice. You had a chance to do so much. This post will be helpful when planning my next trip. I especially want to visit the flamingos. I’ve been to Vegas twice but it was ages ago! I’d love to go back…there seems to be something new there to see every year. It’s so cheap to fly there from where I live too so I could do a quick weekend getaway. Seeing and knowing a different side of Vegas makes this a very informative post. It’s nice to see non mainstream Las Vegas and discover other places of interest in this dynamic place. I’m definitely saving this post for a future trip. this was so helpful! I am actually planning a trip for next year so this helped so much thanks!!! I cant wait to visit! 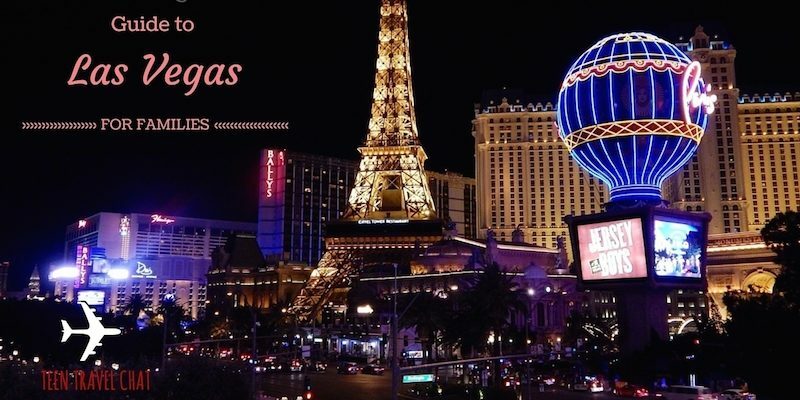 I never would have thought of Vegas as a destination for families since my hubby and I usually make our trip there a Mommy and Daddy trip only. You have definitely given me some things to consider for future trips. I had no idea there was so much you could do as a family. I kind of always envisioned Las Vegas being an “adult only” type of destination. It sounds like you all had a wonderful time indeed. This is one trip I hope we can do this summer or spring. I would love to go to Las Vegas. We have always talked about going there some day. This year could be our year. Thanks for sharing your experience. The polaroid museum looks really fun. I have always wanted to go to Vegas. Vegas is an incredibly overwhelming place to visit, and you really need more than one time to soak it all in. I went years ago, and need to return. I have learned a few planning tips for the next trip. I would love to visit the Polaroid photobar and Andy Warhol museum. Last year the Scentsy family reunion was in Vegas but I was pregnant and missed it. Would love to go visit one day!